These well equipped apartments are situated from the ground floor up to the fourth floor and can accommodate up to 6 persons. Every three-room-apartment has an air conditioning and heating system, a large terrace with barbecue, safe, satellite-tv, Wi-fi connection, kitchenette with microwave, fridge with freezer, dishwasher and washing machine. There are two bedrooms: one with a double bed and one with 3 single beds (or combined as 1 double bed and 1 single bed). There is also a sofa bed in the living room. Lido degli Estensi is considered to be the touristic capital of Lidi di Comacchio. It is one of the principal destinations on the Adriatic Coast, and base of the new yacht harbour "Marina Estensi". A perfect holiday place for people who love the seaside: beaches with fine golden sand with all the necessary services: beach games, acquagym, entertainment; a sea with shallow water, no cliffs and ideal for children. In the main street of the city You'll find several shops and boutiques. Another interesting attraction for tourists are the restaurants, cafés and taverns, where from breakfast to dinner You can taste the typical traditional plates of Emiglia Romagna, but also of the international kitchen. In the evening Lido degli Estensi offers many amusement possibilities such as music in the squares and on the beach, luna parks for children, pub and discos for young people, shopping and entertainment in the centre. Our Residence has got a fitness room, a relax area with sauna and Turkish bath, a large outdoor swimmingpool surrounded by a sunbathing area with beach umbrellas and sun loungers, and a spacious private parking. 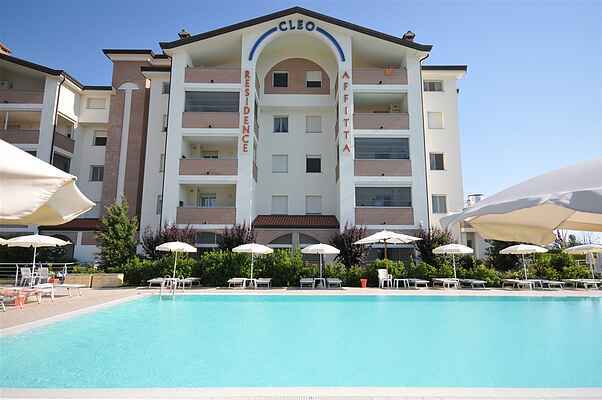 The beach is located at 800 mt from Residence Cleo. Here you can find several bars where you can buy snacks and drinks, entertainment for adults and children, a children's playground and a swimming pool. Sun beds and umbrellas can be rented with a special discount directly at our reception.